Keep students active and engaged with Luxor’s economical Sit to Stand Student Desk. With heights varying from 30” to 45.25”, the school desk easily adjusts to fit both young and adult students. 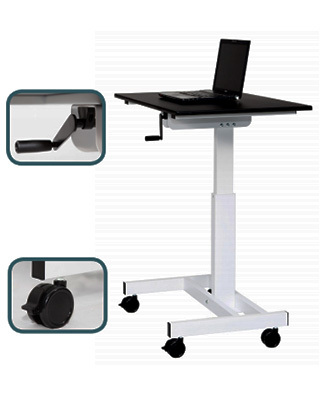 Additionally, the front facing crank gives pupils the freedom to alternate between sitting and standing without stepping away from his or her desk, while the four casters provide the mobility required for student collaboration. This costeffective option conserves space with its single column and slender legs, while the tabletop is large enough to adequately hold laptops, books, and other school supplies. Choose Luxor’s efficient crank desk and provide the optimal learning environment for your classroom.